There are few things that seem more American than Cheez Whiz, though not necessarily for the best reasons. Its critics often cite its processed orange gooeyness as exhibit A to explain why our country’s diet can lead to obesity, heart troubles and, perhaps even, Alzheimer’s. And, with apologies to the city of Philadelphia, it doesn’t even taste all the good—as one former Kraft employee honestly put it, Cheez Whiz “tastes like axle grease.” But, while seeming as American as imitation apple pie, Cheez Whiz wasn’t invented for palates in the USA; instead it was created for the British market as a shortcut for making the much beloved (in the UK) traditional dish, Welsh rarebit. Swiss cheese makers first developed commercially processed cheese in 1911. According to food scientists, Walter Gerbe and Fritz Stettler were trying to figure out a way to make cheese that lasted longer and did not spoil quickly. Using their native Emmentaler cheese, they shredded, heated, stirred and added sodium citrate (sometimes called sour salt) to the mixture, producing something that’s halfway between cheese and milk and has a much longer shelf life. Despite these Swiss innovators, it’s Canadian-born James L. Kraft that holds the first US patent for processed cheese. As Kraft states in the 1916 patent, his intent was to find a way for cheese to “be kept indefinitely without spoiling.” Mostly following the Swiss formula (though, it’s unclear if Kraft knew about Gerbe and Stettler’s innovation), he details his process of slicing, heating and stirring to achieve sterilization. What Kraft leaves out in the patent, however, is his addition of a sodium additive. This is perhaps due to the patent being public and Kraft wanting to hide his secret. Either way, his timing couldn’t have been better - the next year, the Army bought six million pounds of his processed cheese to send overseas to American soldiers fighting in World War I. Besides the financial windfall, Kraft cheese became instantly recognizable to a whole generation of young American men. Two and half decades and another World War later, Kraft Cheese had become a worldwide brand. In 1950, Kraft introduced the “Kraft Single,” which Progressive Grocer reported increased cheese sales “as high as 150 percent.” Looking to further expand their market, the company took their processed cheese products overseas, specifically to Britain. Welsh rarebit (or perhaps Welsh rabbit) dates to 18th century England, but the specific origins of it are somewhat unknown. One legend says it was invented almost as a joke, a dish served after an unsuccessful rabbit hunt. Others say it simply was a tavern food, a cheap and tasty treat enjoyed by drunks - like an 1700s century version of cheese fries. Despite its rather meaty sounding name, the dish contains none. It is made by pouring a cheddar cheese sauce (sometimes mixed with beer, wine or ale) over a piece of hearty toast, like pumpernickel or rye. Though that all sounds easy enough, the making of the cheese sauce can be laborious and tedious due to all the melting and stirring. Kraft figured there had to be a better way. Conscious of their English market, in 1950, Kraft began development on a pre-packaged cheese sauce for use on Welsh rarebit. 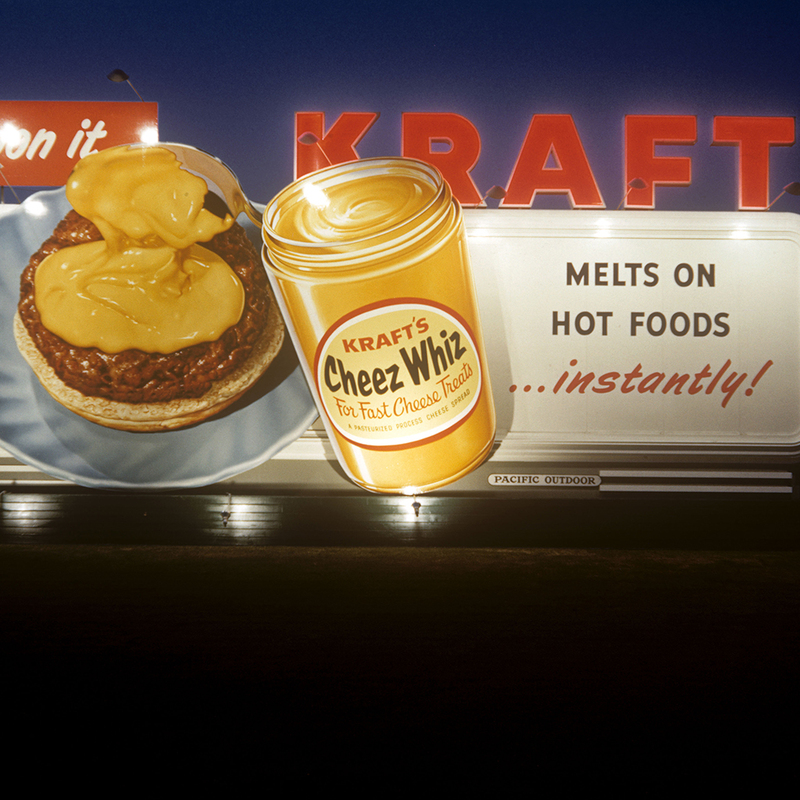 Employing some of their best food scientists, including Edward Traisman (who later would develop the way McDonald’s flash froze its French fries), Kraft came up with Cheez Whiz - a (intentionally) mild tasting cheese sauce perfect for Welsh rarebit. In 1952, Kraft introduced the product in Britain. It was a hit. A year later in July 1953, Cheez Whiz came to the United States, forever etching its processed cheesy name in American food history and on to cheesesteaks everywhere.